​We now offer Full Service Grooming here at Chimney Hills Animal Hospital! Our Groomer, Cathy Gayton, has 20 years of grooming experience and can do everything from baths and nail trims, to full service grooms. With experience grooming every size of dog from teacup yorkies to newfoundlands, she’s got your furbaby covered. Grooming is available Tuesday through Saturday with Full Grooms Starting at $40 and Basic Grooms starting at $35. 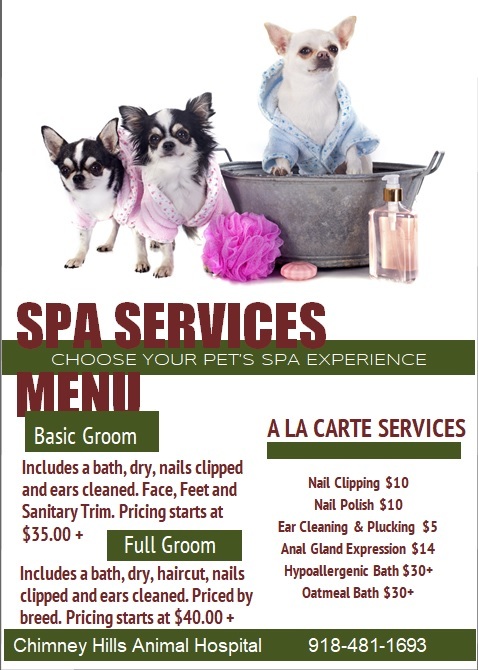 Call today to schedule your fur babies spa appointment!